Boko Haram insurgents have killed 13 people and sacked two villages overnight in the restive town of Konduga in Borno, Brig.-Gen. Bulama Biu, the Acting General Officer Commanding 7 Division of the Nigerian Army, confirmed the attack on Thursday in Maiduguri. Biu said, however, that troops rose to the occasion and repelled the invaders, who had repeatedly attacked communities in the Konduga Local Government Area over the years. He disclosed that he had visited the attacked communities, Bularin and Kofa, including camps in the communities, housing thousands of displaced people. â€œI was there. We recovered one dead body and saw burnt houses. 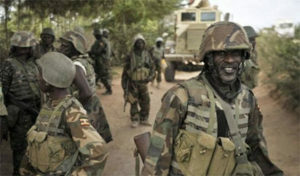 Troops have been following up on the attackers,â€ said Biu. Alfred Audu, a member of a militia, known as Civilian Joint Task Force, who claimed he was on duty at the time of the attack, said the insurgents engaged troops in a bid to force their way into the communities. Audu said the insurgents were pushed back when fighter planes were deployed to confront the invaders. Modu said the insurgents launched rocket attacks and forced their way into the IDP camps and also attacked homes with ferocious fire. He said that nine people were killed at Bularin IDP Camp and three others in the Kofa IDP Camp. â€œAn Islamic cleric together with his wife and three children were burnt to death when the insurgents sacked their home at Bularin IDP Camp. â€œThey burnt down the village market, shops, houses, animals and vehicles. Many people died in the attack while others are still missing. â€œBularin village was razed and several tents in the camp destroyed. Many people were displaced in the attack,â€ Modu said. Boko Haram, which also operates in Cameroon, Chad and Niger has persistently attacked communities in northern Nigeria, especially the countryâ€™s vast northeast. The Federal Government has however, said that the insurgents have been decimated, although the group has been pulling deadly P***hes over the years.